Choose from our Automatic Backwashing filters for high-flow applications. Chlorine reduction, sediment and turbidity, pH neutralizing, iron and manganese removal, and hydrogen sulfide removal. All our systems feature reliable and durable Fleck® control valves with connections up to 3 inches. Media capacity up to 40 cu. ft.
We carry single and twin tank commercial softeners with top quality components and resin. All our systems feature reliable and durable Fleck® control valves with connections up to 3 inches. Softening capacity from 30,000 to 900,000 grains. Clear Solution Services brings nearly twenty years of experience to the design and fabrication of these systems. We have in-house capabilities for the complete system analysis, detailed design, and packaging including control panels and installation supervision. Systems can be supplied from 10 GPM to the 200 GPM or to client specifications. The pressure switches are located at the tank and the signals from the pressure switches are sent to the control panel. The control panel directs the pump operation. The first pressure switch is set at a loss of 5 psi from the working pressure. This will cause one pump to operate. The other pressure switch is set at 5 psi below the first pressure switch. This will cause the second pump to turn on & operate in conjunction with the first pump if additional flow rate is required. The tank is a vertical ASME steel tank that can be painted to customer specifications. Tank will be pressure rated above the working pressure and tested to 1.5 times working pressure. Tanks are fitted with a "heavy-duty" Butyl Diaphragm. A structural steel skid will be provided with the tank, pumps, control panel, pipe, valves, and fittings installed. Unit will be factory tested and fully operational. The skid will be blasted and coated with epoxy. Our high pressure systems are a complete watermaker system, with boost pump, fresh water flush, control panel, prefiltration, high pressure pump, and membrane / pressure vessel array, and all 316 stainless steel components. The Reverse Osmosis process uses a semi-permeable membrane to separate and remove dissolved solids, organics, pyrogens, submicron colloidal matter, viruses, and bacteria from water. The process is called "reverse" osmosis since it requires pressure to force pure water across a membrane, leaving the impurities behind. Reverse Osmosis is capable of removing 95%-99% of the total dissolved solids (TDS) and 99% of all bacteria, thus providing safe, pure water. Clear Solution Services offers a wide range of state-of- the-art, skid mounted water filtration systems and ancillary equipment. We will analyze your project requirements and design a system according to your specific needs, whether it be offshore or onshore. The end product is a safe and reliable water filtration system at an economical price. An array of engineered modular components are carefully selected and incorporated into the system to maximize efficiency and minimize floor space. 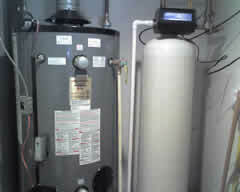 A good water treatment program is a necessity for maintaining chiller efficiency. 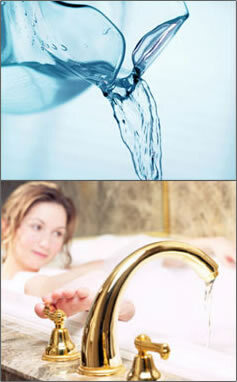 Maintaining the proper water treatment will prevent costly problems. If a problem(s) already exists, take the necessary steps to correct it immediately. The results can provide significant energy savings with greater chiller efficiency, maximized equipment life, and reduced overall maintenance costs. A water treatment program provides a biocide program that minimizes microbiological growth along with excellent scale and corrosion protection. Microbes, if not properly controlled, can cause numerous problems, such as forming sticky slime deposits in the tube bundle of a chiller, possibly reducing heat transfer efficiency 15 percent or more. The situation can be compounded by the formation of permanent scale or iron deposits on the sticky site. If this occurs, an additional 10-20 percent loss in heat transfer efficiency may result. To fix the problem and restore lost efficiency, an unscheduled shutdown and physical cleaning of the chiller may be required. Furthermore, if no action is taken to improve the water treatment, under deposit corrosion may occur throughout the condenser system, which may create leaks in the transfer piping.